The dried sap from the immature seed pods of the opium poppy (Papaver somniferum) is a potent narcotic. Although once popular as a painkiller most opium is now refined into heroin and sold illicitly for high prices in almost every city on the planet. All of this heroin started life as the gum gleaned from Papaver somniferous, the opium poppy. For decades most of the worlds illegal opium has been produced in Afghanistan and the ‘Golden Triangle’, a region of south-west Asia. In recent years the amount coming out of Latin America, predominantly Mexico and Colombia, have increased, though cocaine is still the most widely produced drug in the region as it is far easier to refine in large amounts and is currently very popular which means high prices are paid for it. Opium is obtained from the unripe seed pods of the opium poppy and this is the only poppy that produces opium even though almost all poppies will bleed a milky, sticky latex-like sap if the unripened seed pods are nicked with a sharp knife. Legal production of opium to use as a base for narcotic analgesics accounts for more than 50% of the opium grown worldwide. Australia and India have ideal poppy growing climates and most of the medicinal opium is grown in one of the two countries. 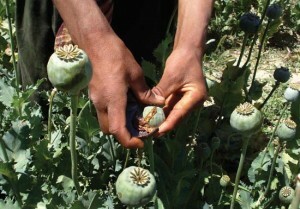 Opium is widely used as a local native medicine in some parts of the world and the process of obtaining it is simple. The unripe seed heads are slit from just beneath the flattened head of the pod down to the area where the pod joins the stem. This is done several times allowing the latex to seep out. This is collected, boiled in water, passed through a simple filter and dried. The opium contains a number of active ingredients that work together to make this a potent pain killer. Indigenous people in these areas smoke it, eat it or prepare it as a drink, all of these methods of ingestion provide them with the opiate effect of the drug. Opium poppies look VERY like the common oriental poppy and care should be taken to make sure you get the ornamental variety for your flower bed. Most people cannot tell them apart unless they know a good deal about the poppy genus. So planting your painkillers close to regular oriental poppies will most likely keep them un-noticed.